This is my favorite salad of all time. Today I am sharing the healthier version though as I am still on my diet. It's going pretty well really and I'm happy that the Shavuos holiday didn't effect my weight too much. I am still going strong and that feels fantastic! I love pasta and there is noway I would ever be without it, diet or no diet. That does involve a lot of carbs though so it's not really the healthiest choice. I was so thrilled when I found this brown rice pasta at my grocery. I was kind of worried at first about the difference in taste- as you know I am no fan of whole grains..I just don't really like how they taste. I was even happier when I cooked it up and it was absolutely delicious. It didn't even taste all that different in comparison to regular white pasta and I have been buying it ever since. 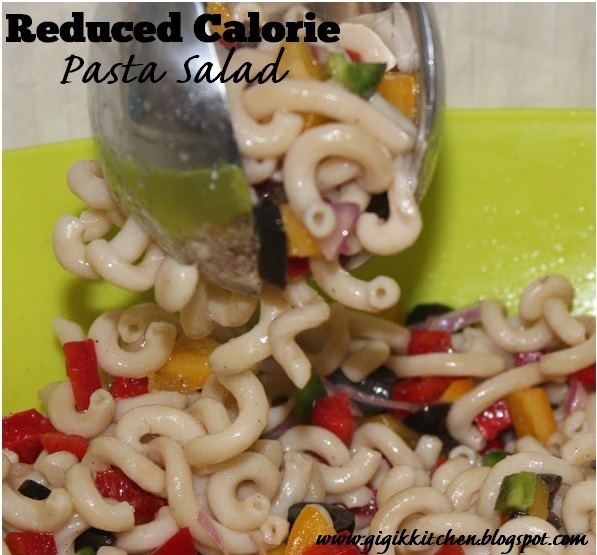 The calories are half of what white pasta adds up to and it tastes just as good so how can you go wrong with that? If you too love pasta and feel you just can't be without then this is the way to go. The only real change is the cooking time. As this is made of rice it takes quicker to cook so it's important to keep that in mind. Overcooking can cause some serious mushiness and that isn't good anytime! I'm glad that I can still enjoy one of my favorite salads without the calorie guilt! I thought I'd share the recipe with you today. Whether you are on a diet or not I think this is a great dish to accompany any meal! It makes the perfect side dish for the Shabbos meals or just as a lunch on a regular day. The best part is that there isn't any major preparation to be done and it can be ready in under 10 minutes. I prepared this for a side dish for our Shabbos meal a few weeks back. I usually share the calorie amounts for my low calorie recipe posts but I honestly don't remember the exact number. I do know that it was at least reduced to half from the calories my original recipe contained. If I do manage to calculate it properly I will definitely add it in here at some point. 1. Bring a pot of salted water to a boil. I like to add a drip of oil at this point as well to keep the pasta pieces from sticking to each other or to the pot as they cook up. Once the water has come to a boil add the pasta and let it cook for about 5-7 minutes or follow the package directions for the amount to get it cooked the way you like it. Stir constantly as it cooks. 2. While the pasta is cooking up begin chopping up your veggies. I'm not very precise in how I chop them up but I try for small-medium squares for the peppers and slivers for the red onion. 3. Combine the safflower oil, white vinegar, sugar, salt and pepper in a medium sized bowl. Whisk the ingredients together until they are completely combined. 4. Once the pasta is ready to your liking, remove it from the pot and pour it into a strainer to remove any cooking water. If you like your dressing to be a bit thicker you can reserve 1/8 cup of the cooking liquid and add it to your sauce at this point. That will add some extra texture and flavor. Move the pasta to a large serving bowl. 5. Once the pasta has cooled off a bit drop in your veggies and add your dressing. Mix the salad to bring it all together and serve cold or warm. What is your favorite salad to eat when you are dieting? Let me know in the comments form below...I love to hear from you!